Children have the right to know the truth about how life evolved on earth. 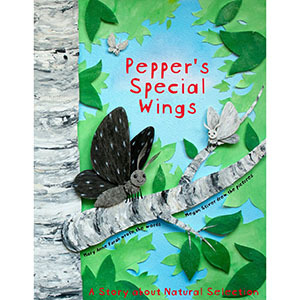 “Pepper’s Special Wings” shows children aged 4-7 how Charles Darwin’s evolutionary theory of natural selection works, using easy words and colorful pictures they can understand, but based on an actual scientific case study. Children will also identify with Pepper’s social struggle, since self-esteem, self-image, bullying, and being teased are recurring childhood themes. Children will see that sometimes being different is what makes them amazing! A special section for parents gives background information and suggestions for research to share with their children as they mature.